Where possible, services will be highly available. At least 3 docker swarm manager nodes are required, to provide fault-tolerance of a single failure. GlusterFS is employed for share filesystem, because it too can be made tolerant of a single failure. Where multiple solutions to a requirement exist, preference will be given to the most portable solution. Services are portable, meaning a particular stack could be shut down and moved to a new provider with minimal effort. 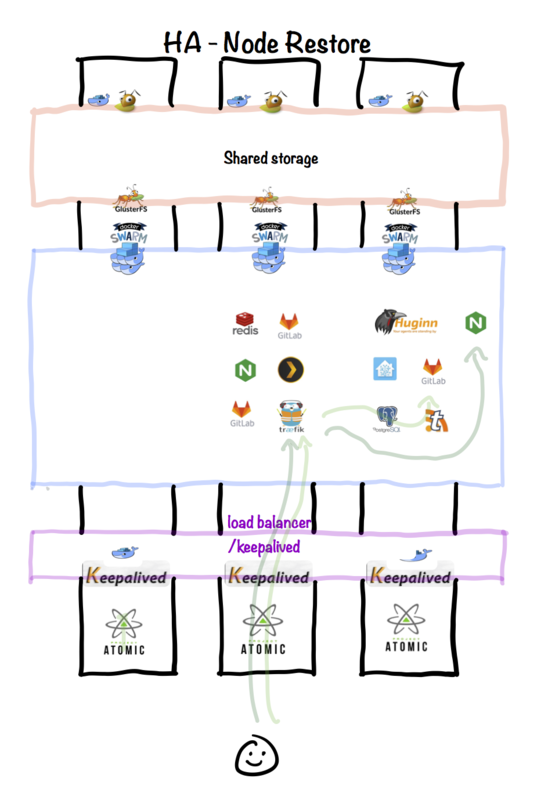 All 3 nodes participate in the Docker Swarm as managers. The various containers belonging to the application "stacks" deployed within Docker Swarm are automatically distributed amongst the swarm nodes. 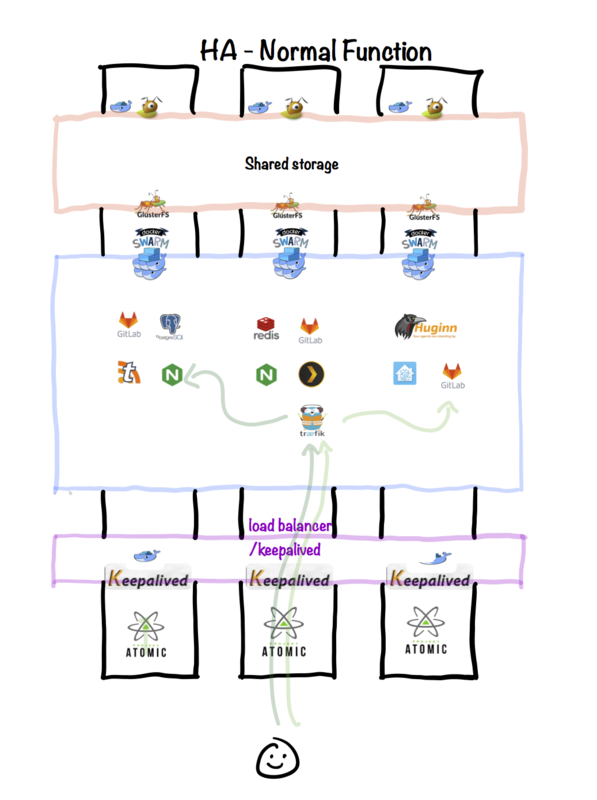 Persistent storage for the containers is provide via GlusterFS mount. The traefik service (in swarm mode) receives incoming requests (on http and https), and forwards them to individual containers. Traefik knows the containers names because it's able to access the docker socket. All 3 nodes run keepalived, at different priorities. Since traefik is running as a swarm service and listening on TCP 80/443, requests made to the keepalived VIP and arriving at any of the swarm nodes will be forwarded to the traefik container (no matter which node it's on), and then onto the target backend. The failed node no longer participates in GlusterFS, but the remaining nodes provide enough fault-tolerance for the cluster to operate. The remaining two nodes in Docker Swarm achieve a quorum and agree that the failed node is to be removed. The (possibly new) leader manager node reschedules the containers known to be running on the failed node, onto other nodes. The traefik service is either restarted or unaffected, and as the backend containers stop/start and change IP, traefik is aware and updates accordingly. The keepalived VIP continues to function on the remaining nodes, and docker swarm continues to forward any traffic received on TCP 80/443 to the appropriate node. A day after writing this, my environment suffered a fault whereby all 3 VMs were unexpectedly and simultaneously powered off. Upon restore, docker failed to start on one of the VMs due to local disk space issue1. 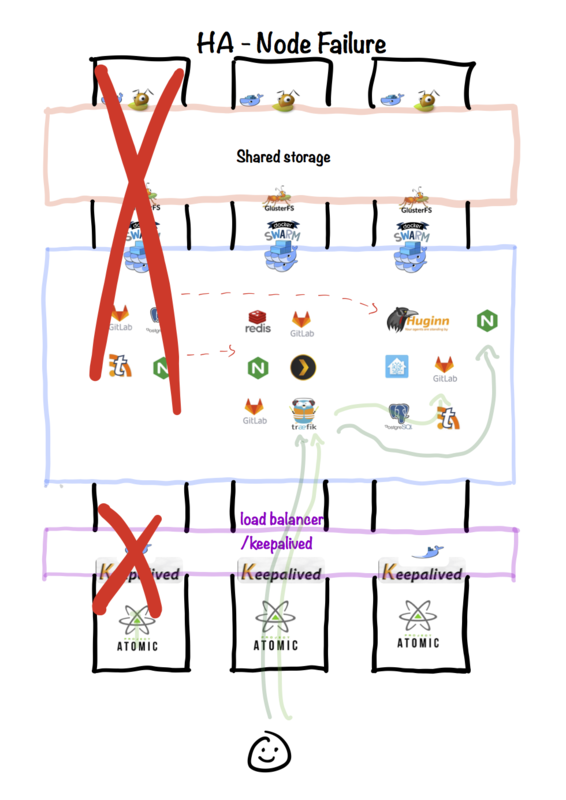 However, the other two VMs started, established the swarm, mounted their shared storage, and started up all the containers (services) which were managed by the swarm. In summary, although I suffered an unplanned power outage to all of my infrastructure, followed by a failure of a third of my hosts... all my platforms are 100% available with absolutely no manual intervention.